Here's a book that I bought some months ago, only for it to disappear under a pile of quirkier, more remarkable tomes acquired from eBay. 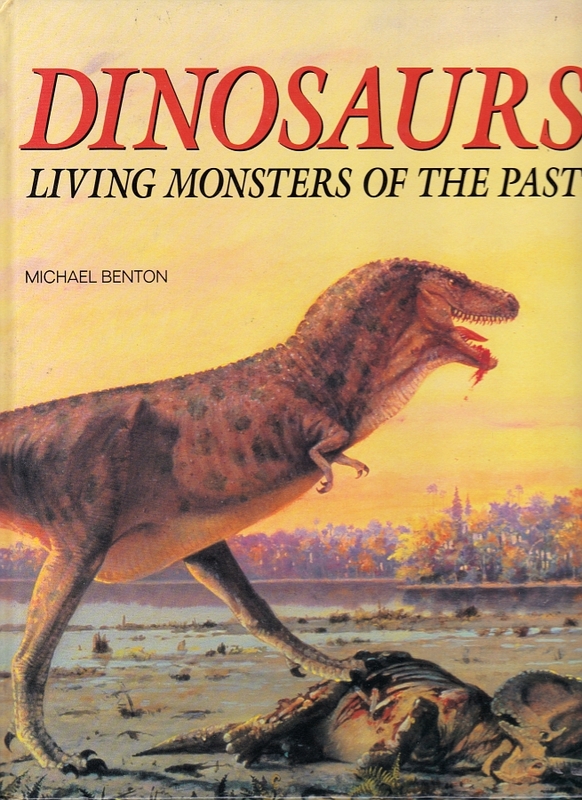 It's very typical early '90s fare (1993 specifically), authored by palaeontologist Michael Benton (who writes a popular book on dinosaurs aimed at a young audience every morning over breakfast) and illustrated by a number of artists, but mostly John Sibbick. However (and quite apart from the fantastic cover), I may have unfairly overlooked it. The Sibbick pieces on their own are worthy of a VDA post, and it's exactly those that I'll be looking at here. Today we welcome Rohan Long to the blog to offer his insights about The Lost World novel. Rohan is a zoology teaching guy at University of Melbourne. You can find him on Twitter @zoologyrohan and listen to his new musical project, Bronzewing, at bronzewing.bandcamp.com. Take it away, Rohan! The Lost World, published by Michael Crichton in 1995, must have been one of the most anticipated literary sequels of all time. And yet, it seems to have been forgotten almost instantly. The basic plot (spoiler alert?) 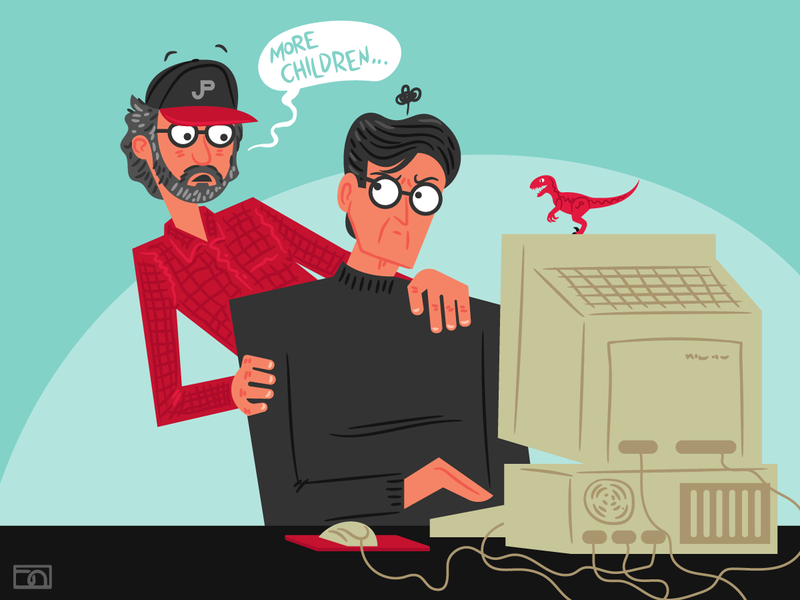 is that mathematician Ian Malcolm has teamed up with palaeontologist Dr. Richard Levine to find a remote, isolated region where non-avian dinosaurs have escaped extinction. The appearance of a number of unusual animal specimens leads them to Isla Sorna in Costa Rica. They are joined on the island by field biologist Sarah Harding, a couple of engineers who designed their gear and two precocious high school students – you can almost see Spielberg standing over Crichton’s shoulder at the computer, cajoling him to add some kids to the cast. Unbeknownst to our team, they are followed to the island by unscrupulous geneticist Lewis Dodgson and his team of expendable dinosaur chew toys who are attempting to steal the animals for their own nefarious ends (again). Writerly advice? Illustration © David Orr 2016. In contrast to Jurassic Park’s amiable Alan Grant, Crichton writes Levine as an irritating pedant, albeit one with the fierce intelligence to back it up; “the best palaeobiologist of his generation, perhaps the best in the world”. Yet it’s hard to believe that a brilliant, world-renowned scientist would think that a remnant population of living dinosaurs is a plausible scenario. This is fringe stuff; the sort of thing only taken seriously by young Earth creationists and cryptozoologists. Levine even puts forward Mokele-mbembe – a folkloric sauropod from the Congo beloved by both aforementioned groups – as supporting evidence for his ‘lost world hypothesis’, a suggestion more befitting a recreational sasquatch hunter than a world authority on palaeontology. Malcolm’s stated reason for being on this expedition is that it will allow him to work out the cause of the Cretaceous mass extinction. This is basically a silly idea and Crichton is coy as to how exactly one would make this deduction. The majority of the dinosaur species on the island weren’t even alive during this era. Ok, Tyrannosaurus, Triceratops, Parasaurolophus and Pachycephalosaurus were right there at the KT boundary, but how is the behaviour of say, Procompsognathus - extinct around 145 million years earlier - going to contribute to this theory? There’s a constant nagging question plaguing the book - why on earth would Malcolm willingly place himself on yet another island full of blood-thirsty dinosaurs - and this flimsy premise for a science experiment cannot and does not fulfil this narrative shortcoming. Throughout the novel, there’s an unearned air of absolute certainty from the scientist characters. We hear Harding explaining exactly what the predator-prey ecology should be like on the island, Levine authoritatively identifying dinosaurs to species level based on a glance – how could they possibly know this stuff? Crichton was by no means a stupid man, but half way through The Lost World I felt like I was reading Dunning-Kruger Effect: The Novel. A vast amount of the dialogue is clearly intended to make the reader think, ‘Wow! These people are so smart!’ – and that’s certainly how I responded when I was younger – but this time around I found it grating and unwarranted. In the later years of his career, Crichton showed a tendency toward scientific conservatism and denialism. Knowing this, it’s hard not to pick up on passages in The Lost World as precursors to this kind of thinking. One of Malcolm’s early speeches about the nature of evolutionary thought contains noticeable creationist talking points – even quoting Hoyle’s famous line about evolution being as improbable as ‘a tornado sweeping through a junkyard and assembling a Boeing 747’. The final statement of the book, spoken by engineer Thorne, but it could have easily come from Malcolm or Levine, basically states that because people used to believe in phlogiston and the like, all science is fantasy and can’t be trusted. I’m critical of The Lost World, but I have enjoyed revisiting it. I realised that this novel contained some of the most evocative scenes of life at a university and as a field researcher that I had read as a young person. The descriptions of Levine and Malcolm’s research and meetings at academic institutions in California, the passages about Sarah Harding’s work on hyenas and her struggles as a female scientist; these really stuck with me as a teenager. That’s what I’m hoping to take away from this re-reading and not the silly caricature of science so inevitable of mass-produced pop culture. And as a bonus treat, I really dig Rohan's Bronzewing album, so take a listen. How do paleoartists support themselves? It's hard enough for any artist, and illustrating ancient taxa and environments is a niche pursuit. Add to that the significant investment of time, equipment, and research effort required to make an original piece of paleoart that can stand up to scrutiny, and the challenges are obvious. It's damned hard to make a living doing it. Some have taken to Patreon, a crowdfunding platform that allows for monthly pledges from a base of patrons to supplement, and hopefully sustain, careers. 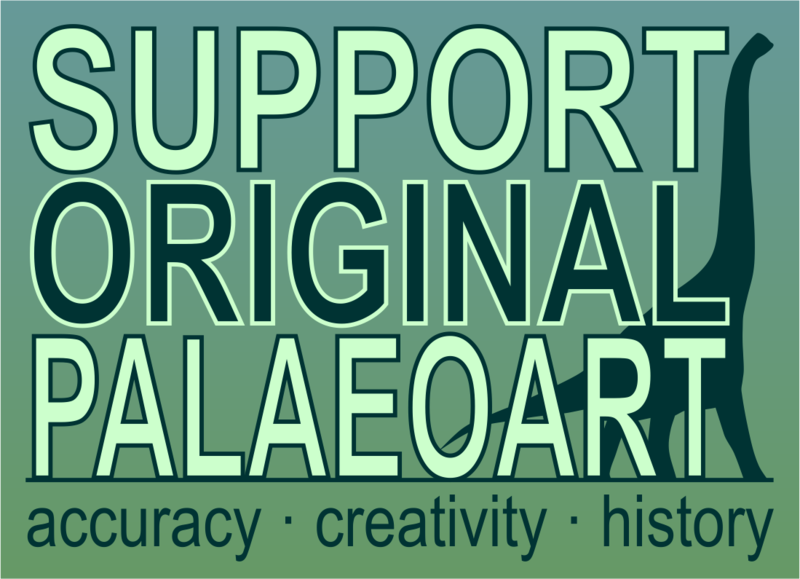 Having seen a number of my comrades take to Patreon over the last year or so, I've delved in and assembled a list of all of the paleoart Patreon campaigns I could find. Since there's not a huge list at the moment, I also included other dinosaur-related projects that deserve attention. Please feel free to add any in the comments that I may have missed. Not all of these are Scientific Illustration in the strictest sense, but I'm of a mind that creative work that honors contemporary paleontological science and thoughtfully depicts ancient life in a way that provokes curiosity should be part of the conversation. Can a work like Mike Keesey's Paleocene spark an interest in paleontology even though it features talking animals? Of course it can. Paleoart is part of the larger effort of paleontological outreach, and is therefore dependent on how much money flows to publishing researchers and their institutions. In an ideal world, researchers would earn enough to live comfortably and their work would be sufficiently funded to pay illustrators enough to do the same. While it's true that we arguably have more paleoartists turning out work than at any other point in history—flooding the market as it were—we also live in a time of unprecedented discovery and description of new taxa. The public deserves to have richly illustrated paleoart accompanying many of these publications, and scientists and artists deserve the compensation to fill that need. Until we're closer to that ideal world, most paleoartists who hope to make a career of it have to add self-promotion, business management, and website development to their already-full plate. To sell their wares, they may choose one of many print-on-demand services like Zazzle, Society6, Redbubble, or DeviantArt. If they are able, they may choose to produce and fulfill prints on their own, with the risks and labor inherent in that. Thanks for reading! I hope this post sends a few pledges these folks' way. While I've been busy enough with freelance projects and work that I've not been able to devote much time to LITC lately, I have a couple paleoart-related projects on the burners, with which I hope to address the needs of paleoartists and the sustainability of the craft as a field. Stay tuned for more on this over the next several months. 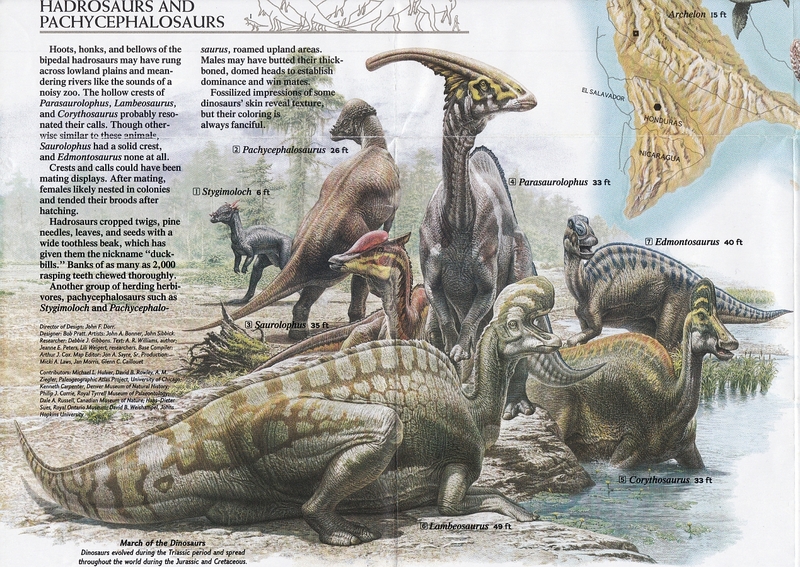 Vintage Dinosaur Art: Dinosaurs, National Geographic, January 1993 - Free poster bonus! Those of you with a nostalgic fondness for the January '93 issue of National Geographic featured in the last post will likely recall the free poster to be found within. Happily, the copy of the magazine that I bought on eBay arrived complete with said freebie, in all of its glossy, double-sided 1990s glory. One side of the poster displays a map of North America in the Late Cretaceous, surrounded by groups of Late Cretaceous dinosaurs illustrated by John Sibbick; the other features 'Dawn on the Delta', a lovely panorama starring Anchiceratops and painted by Robert Giusti. Let's look at the Sibbick side first of all, and specifically this delightful group of hadrosaurs, because the whole thing won't fit in my scanner and my photographs of it are terrible.